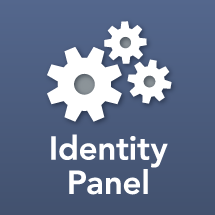 Before deploying Identity Panel ensure you have servers available meeting hardware and OS requirements. Obtain required accounts, groups, DNS entries etc. Other software prerequisites may be installed in advance or obtained via the Panel Setup utility included with the Identity Panel installer download. When using Azure Marketplace and OneDesign SaaS versions of Identity Panel, web application requirements are not relevant. The following table of system requirements applies to the Identity Panel web application role. It assumes a single server will be used to host the web application and database, and that no other roles (e.g. SQL, MIM) will be hosted on the same server. Requirements are minimums. Number of Identities refers to the number of distinct person identities in an environment with an average of 10 silos or less per user (e.g. 5 MIM MAs, Azure AD connect, and Office 365), and a similar number or fewer of groups. In environments with significantly more silos revise the estimate for number of identities accordingly. Disk space refers to free space on the drive intended to host the Identity Panel database. The following table refers to the amount of RAM overhead expected to be used by Panel Service while performing data collection. This is NOT total server RAM, but rather RAM in addition to what's required for other server roles. Some environment settings may be omitted in test environments, but this is strongly discouraged. Un-proxied network access via HTTPS (port 443) to web application from all panel service instances and end-user web browsers.